The identity of the Plants, Animals and products of the Land Of Punt has always remained a mystery but during the coarse of the past few years and during the analysis of the various inscriptions and mostly the walls mural of Hatshapsut and by studying the plants and animals and the gifted produces in more accurately than what the earl ear Archeologist's had. According to Sayyid al-Qimni, Egyptian historian and thinker in his massive four Volume Arabic books intuited "Prophet Moses & The last days of Tell Al Amarneh" from page 239 - 363 suggests the Arbian Pennsula and particularly the region of south Jordan. Also according to Dimitri Meeks in a well researched paper called "Locating Punt" explain in 2011how the hypothesis of an African location for the land of punt is based on extremely fragile grounds. He suggests Arabia for Punt location. He explain:�The territory of Punt began quite close to that of Egypt, once Sinai had been crossed, in Arabia Petraea or the Negev. It inc operate, probably in a rather imprecise manner, the whole coastal zone of the Red Sea dowel as far as present day Yemen and the actual heart of Punt probably correspond more or less to Yemeni Tihama." The first clear mention of Punt comes from the Old Kingdom. As the so-called Palermo Stone tells us, about 2500 B.C. during the reign of King Sahure, an expedition to Punt returned with 80,000 measures of 'ntyw, which scholars believe to be myrrh. Derived from a tree of the same name, myrrh is a resin used to make incense, which the Egyptians coveted for temple rituals; myrrh was the most prized commodity from Punt. Sahure's expedition also brought back 23,030 staves�wood being precious to a desert country like Egypt�and 6,000 measures of electrum, a natural alloy of gold and silver, among other items. The scene of this tragedy can be seen at the coast of the Red Sea near the Asiatic dwellers on the sand where this person was killed while the assembling of the ship that was destined to sail to Punt. A location at the end of the gulf of suez would seem to fit best with the text. This clearly show that the scene of the tragedy must have been near Egypt and in a region Asiatic Bedouins. By the Middle Kingdom, expeditions to Punt had become pyramidal in scope. One inscription from about 1985 B.C. mentions an expedition of 3,000 men; another a half century later boasted 3,700 men. Again, Punt's location is not given. Where did the ships go on the Red Sea after they set sail from Saww? No one knows. Today, scholars have convincingly shown that Middle and New Kingdom pharaohs bent on Punt constructed their ships on the Nile, then disassembled them and carried them 100 miles across the desert from Koptos, the place where the Nile comes closest to the Red Sea. They then reassembled them at the ancient Red Sea harbor of Saww (today Mersa Gawasis) and sailed to Punt. On the return, they unloaded the ships at Saww and transported the goods by donkey caravan back to the Nile, where they loaded them onto other ships for the journey south to the capital at Thebes. Actually the site of Mersa Gawasis �port� was very important port in the Middle Kingdom. Several stealer have been found there dating to the first half of the 12th dynasty contain references of Punt. From the quantity and coherence of these written sources, the amount of enigmatic objects/products and the aired and isolated nature of Mersa gawasis location indicate that this site was on one of the routes to and from Punt by boat. The inscription also inform us that the voyages which were connected with �the mine of Punt� (pB n pwnt) rather than punt. (according to Gardiner 1952) and it seems that the location of this mine could have been at any point in the red sea coast. Many objects where found in this site including unfinished anchor, pegs, pieces of rope, along with fragments of copper alloy chisels. The site or port mersa gawasis seems to give the ancients the choice the outwards journey without problems. Because if the ship departed from a further north point from the Gulf of Suise hoping to reach the gulf of aqaba will not be able to make it. Because inexperienced Alius Gallus (Aelius Gallus was the 2nd prefect of Roman Egypt in the reign of Augustus during the years 26�24 BC.) attempted that rout and he lost his fleet ship and suffered serious damage to the rest of his fleet, from making the direct route round Ras Muhammad. So all ships that left Egypt should land or sail towards the Arabian Peninsula somewhere between Aynunah and Jar in the south. From there ships could sail back up the Arabian coast in small stages, mostly rowing so as to reach the gulf of Aqaba in trance. Whats interesting, one their return from the Gulf of Aqaba winds a currents would again carry the ships towards the Egyptian coast in the area of Mersa Gawasis. The last expedition to Punt that we know of occurred under Rameses III, in the 12th century B.C. An ancient papyrus records that Rameses III "constructed great transport vessels ... loaded with limitless goods from Egypt. ... They reached the land of Punt, unaffected by (any) misfortune, safe and respected." And they returned safe and respected. The details in Harris (Papyrus Harris collection in the British Museum) of an expedition sent by Ramsesses III to punt reinforce the impression that the northern end of this gulf of Suez, in all periods of the year, provide a favorable point of departure for long distance expedition. Ramesses does tell us that they sailed on the �Great Sea of muqed� in order to reach Punt. Muqed is usually understood as two words, mw kd, meaning the revers water (the sea that flows backwards) which seems to mean the Sea that goes from south to North. Which allouds to the currents of the Gulf of Aqaba , which are the reserve current of the Nile. Another important detail, Muqed appears in several series of toponym devoted to Syria-palestine, at Aksha, Amara and soleb. All these names were closely linked to Punt. A Papyrus from the region of Ramsses IX confirms that this land was bordered by the sea, and it was inhabited by Shosu Bedouin. And this lead us to Sinai with the Gulf of Aqaba coasts. So in conclusion we do know many of the routes taken to reach punt. It could certainly be reached by boat from the Red Sea. During the Old Kingdom this involved crossing the desert east of Memphis to the Gulf of Suez, or Mersa Gawasis or setting off from the Sinai and then thought the so called King's Highway. And it seems that during the Middle Kingdom and afterwards, when the kingdom capital moved south, the Red Sea journey to Punt originated from the port of Quseir. At a height of 1035 metres above sea level, are the remains of an ancient centre of worship where the Edomites communicated with God. The Edomites who rose to prominence during the Late Bronze Age lived, up on the Ash-Sharah highlands and in some part of Wadi Arabah next to Midian. Genesis tells us that the Edomites who were the descendants of Esau who had red hair and a wild nature, with easy-going personality, married from other non-Israelite tribes. Giving the Edomite a special Neutral statues between the tribes specialy on desputes. Esau was the grandson son of the holy man and shepherd Isaac son of Abraham, who was also a shepherd. It seems to be a major error to imagine that these Wonduring Aramean Shepherds (Abraham, Isaac), were mere wandering nomads living in tents and lived in tents, and kept large herds of animals of little or no significance in their day. However, they were men of high social status; as men of influence, importance, distinction, considerable wealth and power. Therefore, it is clear that the biblical family were notable and by no mean- regular. They were Holy Men, seers, and more..
Abraham was honored by Melchizedek on his way from Ur, and to the Hittites in Hebron, he was considered a prince along with Sarah. All this points to a man of distinction and power. Of such an esteemed, honored, respected and well-known Shepherds family came the Edomites who were desendant of both lines of Abraham that of Sarah and Hagar. According to the Book of Jasher, Moses fled Egypt to Edom. Where he was greeted by Jasher's grandfather, Herzon the Edomite. Moses lived amongst Hezron's people for some time. Jasher being the highest judge of all the tribes. So according to the book of Jasher, the Edomites were the Lord Hosts and the highest Judges of the area. So what does this all mean, the Edomites were the tribe of the highest Judges of the area? Could it be that the Edomities had more wisdom than the other tribes, or that they could see things that nobody else could? So is it possible the judges of this ancient culture took something during tribal dispute? Could it be that the Edomities were involved in the Serpent Mystery like their neighbours the Midinites? The biblical serpent mystery is rarely touched upon by scholars, because they have no clue or background on the substances of that time and our human Hyperspace. The same hyperspace that Moses entered and many other before him.. The bible actually talks about the Serpent Mystery that was alive hundreds of years after Moses. It seems that the serpent wisdom were misunderstood or manipulated with time and it then ended around 745 B.C. In the biblical references the serpent mystery is associated with the specific tribe from Midian called the Kenites who were copper smiths and metalworkers and were more advanced in the arts than the other tribes. This serpent mystery is associated with the use of substances with magical/mind altering properties. According to the biblical account this magical substance was known as the “Showbread" to the Israelites. The Showbread was eaten by the priests, in order to connect with the Ark of the Covenant and the breastplate of judgment. According to Exodus (35:31) the Showbread or The Bread of the Presence of God was made in the wilderness by wise and knowledgeable Bezaleel, a skilled goldsmith and craftsman. Exodus describes how Bezaleel manufactured crowns, rings, bowls, and candlesticks out of pure gold. The Book of Leviticus (24:5-7) states that the loaves were made by fine flour mixed with pure incense. So what kind of incense? And what is this fine flour mix? And why would a goldsmith be in charge of making the Showbread “sacred bread“ and not a baker? So could it be that the Edomites/Midianites/Israelites were ingesting a similar substance to the Egyptian called the Shem-anna? The Shem-anna was taken by pharaohs to increase their aptitudes for leadership; so did the tribes leaders and shamans/Holy men and Judges to increase perception and discern right from wrong? And if so, then what is this mysterious substance composed of? was it a plant substance like DMT or was it it a mineral base drink? The notion of a Sacred Space or Neutral Zone representing the Holy Spirit has been a concept of ancient people, whose brain was more attuned to the energies of nature and more sensitive to the Earth’s vibrations due to more active Pineal gland. To the ancients such Sacred Places of Holiness and Neutrality were used as space for Judgment, Initiation, Sacred Rites and Ceremonies. 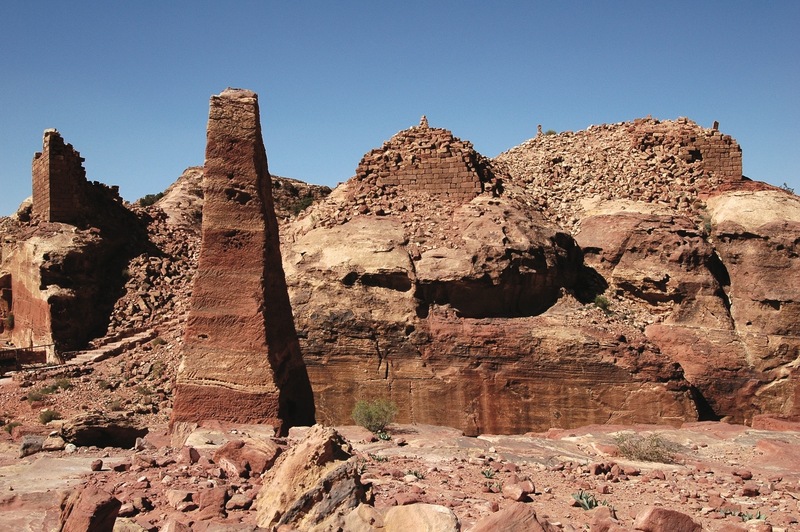 One find compelling evidence that the Edomite’s were trying to make a Sacred Space, when they carved two 6 meters long Obelisks with EAST-WEST direction out of the mountain rock. 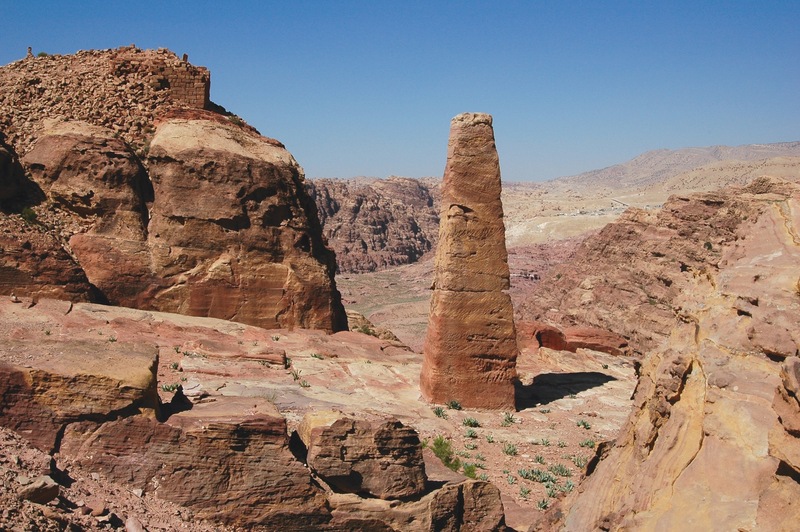 The Bible tells that the early Abrahamic tribes venerated the Queen of Heaven connected with the sanctity of mountains, and represented as a standing Obelisk shaped stone. Note the temple of the winged lion on the background. It was because of this centre of worship and the temple of the winged lion that gave the Edomites the high status among the tribes, and it was this temple that caused the clash with the Hebrews of the building plan of the Jerusalem Temple during the reign of king David. Cut into the rock, to a depth of about forty centimeters, there is a large rectangular depression, known as the courtyard, measuring approximately fourteen meters by six meters. It seems to have been an ancient custom to have a tent of the communion of some sort. The Hebrews Tabernacle Tent dimensions according to the Book of Exodus 40:17-19 was rectangular in shape and it was oriented in a very similar fashion to the Edomites tent where the altar for incense-burning is set on the west direction. 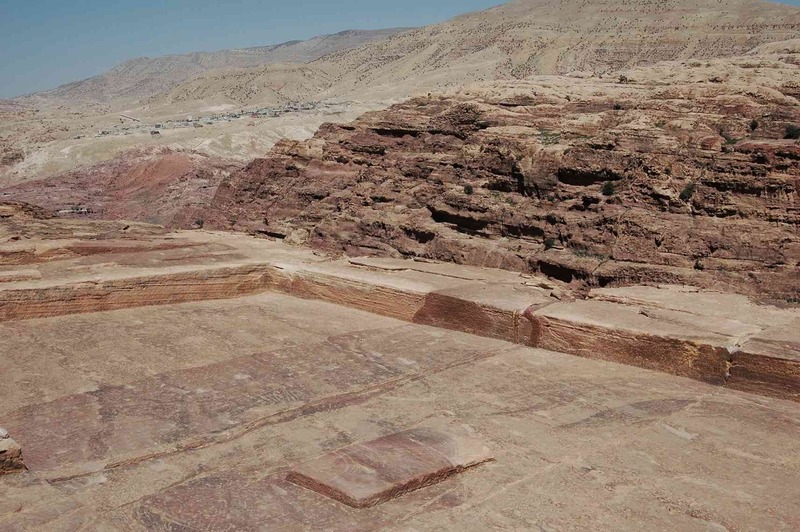 At the high place of Edom and cut into the rock, to a depth of about forty centimeters, there is a large rectangular depression, known as the courtyard, measuring approximately fourteen meters by six meters. In the center of the courtyard there is a small raised platform of stone, fifteen centimeters high, two meters long and less tha one meter wide, which could be the platform for an Ark. The use of an Ark to mimic the holy presence seems to be an ancient concept. A space that was used for a sacred ritual that was common among all the tribes of that time, a ritual that involved a special bread and drink that was taken by the tribes leaders/shamans/holy-men and Judges, in order to connect to device similar to the biblical Ark of the Moses and Aaron and a use of a divination method using a breastplate later to be called the breast of judgment.